Why do people play the lottery, given that their chances of winning are indistinguishable from zero? We all like to believe that we are special. Magic, even. So our dollar ticket will be the winning ticket. Somebody has to win, so why not me? After all, what’s one dollar, anyway? The very nature of the “only one dollar” thinking is the reason that the lottery is so disproportionally tough on poor people. Nobody thinks that a dollar can change their life, except if it is spent for a lottery ticket. Most people, when asked, would say that they wouldn't spend $50 on a lottery ticket. But the same people are very willing to buy a $1 ticket every week of the year. So how can you win the lottery? Clearly buying 175,000,000 tickets isn't the road to riches. A mathematician will tell you that even that drastic strategy is not a guarantee of success. Picking numbers that haven’t been pulled in a long time doesn't really work either. Having a coin land heads-up 50 times in a row doesn't mean that the next flip must be heads. You still have a 50/50 chance of heads. That’s the cruel truth of probability. 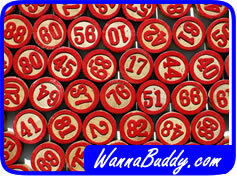 How can you absolutely be sure to maximize your winnings in the lottery. Spend the buck on a donut. Then you are assured of a happy outcome. But good luck anyway!